How Much Will I Make As An Audio Engineer? According to PayScale.com the average salary for an audio engineer in the US is between $25,765 - $82,108 per year, as of September 2015. 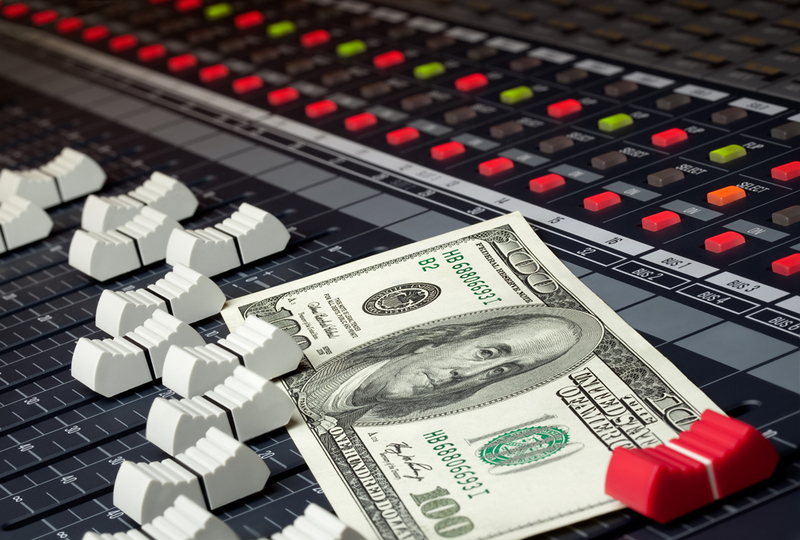 What determines whether or not someone earns a living as an audio engineer? There are some basic answers to this question and some not-so-basic answers that are rarely addressed in most learning institutions. The most obvious answers lie in the technical ability of an engineer. In today's market a complete mastery of a Pro Tools DAW is a must. Pro Tools is the most universal recording application used in most studios, sound labs, foley stages and other sound recording venues. At the higher end of the salary spectrum are the engineers who posses lightning speed at the computer setting up sessions, recording, consolidating files, editing and mixing. Setting up a full-blown tracking session with a studio full of musicians is an art all to itself. With a cacophony of sound swirling throughout the studio, it is the job of the engineer to position each musician with either mic's or a direct line keeping in mind sight lines and acoustic characteristics of each instrument. You have to "dial in" the sound of each instrument in the midst of all the chaos and noise from all of the other players and studio personnel. With a downbeat scheduled for, say, 10:00 AM, you are lucky if the players all finally wander in by 9:30 AM. On top of getting sounds on everyone, you need to make sure everyone is hearing exactly what they want in the cue system. At about 9:50 AM you feel like an octopus on speed trying to herd a bunch of cats'. Recording begins and you continue to refine each instrument's sound while the players rehearse the first song. You must also deal with setting up the Pro Tools template for the session, including, track assignments, auxiliary channels for effects plug-ins, a master fader with an effects chain, refining the cue system, song markers for intros, verses, choruses, bridges, etc. As the recording process unfolds, you will need to keep a close watch on recording levels, CPU overload, buffer size, disk allocation, song markers for punch-in points when players do their fixes and much more. Consolidating files and editing on the fly is something an experienced engineer performs in the course of the tracking session. This includes flying repeated sections like background vocals, consolidating takes and removing unused files, cleaning up unwanted studio noise in silent spots on tracks, etc. Mixing is a very specialized skill and many times is turned over to a mixing engineer. Many years go into developing the skills and ears for creating a market-ready master. The mix engineer refines the sound of each instrument as it relates to the rest of the instruments on the track. A complex balance is needed between all of the elements and achieved with EQ, notching, volume rides, reverbs, delays, compression and limiting. Each individual element of the recording needs to be heard in the proper context of the overall song. The top mix engineers fall at the very top of the salary spectrum as they can make or break a hit song or track. Now, the not-so-basic answer to the question, "What determines whether or not someone earns a living as an audio engineer?" Most people with the proper training can learn the technical part of engineering. The intangibles that set you apart as an audio engineer include a deep understanding and awareness of the sounds of each element of a recording and how they translate from the acoustic sounds in the studio to the digitally recorded sound captured on Pro Tools. Unless a special effect is required from an instrument or voice, it is the job of the engineer to create a totally natural sounding reproduction of each sound of the recording. The other intangible that is not covered by most schools is the attitude of the engineer or aspiring engineer. At the risk of sounding like, "Why, in my day I walked through 10 miles of snow just to get to the studio so I could watch, learn, run cords, make coffee and stay out of the way when necessary", I need to make a personal observation. It is this author's unscientific assessment of young aspiring engineers trying to make a living in this highly competitive field, that it is rare to come across students who understand the importance of paying their dues while learning from the people who have been in the trenches for a long time. As much of the recording world has been taken over by home-studio-owner-operators, the demand for a hired engineer has fallen to only the elite engineer, both in talent and attitude. Be prepared. Be enthusiastic and helpful. Be on time!